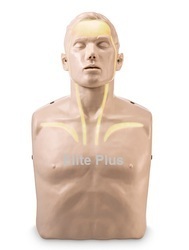 We take pleasure in importing and supplying a wide range of Basic Life Support Manikins. Our range is availed by the clients at the most competitive prices. Under our range, we offer Adult Water Rescue Manikin and Weighted Adult Rescue Randy Manikin to name a few. Besides, these are manufactured by the expert professionals taking assistance of most advanced machineries. Also, this range finds numerous applications in various hospitals and many such places. 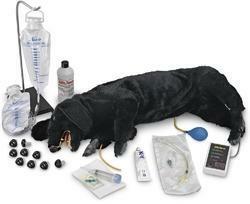 The Advanced Sanitary CPR Dog Manikin provides each student with their own sanitary muzzle and nosepiece with a one-way valve. The muzzles may be disinfected and reused, while the nosepieces and lower airways are disposable. and coordinate the respiratory cardiovascular functions. An IV can even be established for more advanced training. The Advanced CPR Dog Manikin is connected to a small box that displays a light when the correct ventilation volume is applied, another light indicates correct position for cardiac massage, a third light indicates correct compression depth, and an audible beep and light indicates excessive pressure is being applied. A visible chest rise appears when correct ventilations are applied. ¿¿ Compression Indicators: Depending on the CPR quality, indicators will light partially or completely. Completely lit indicators indicate the procedure has been performed correctly. Indicators are interrelated with the given default value of depth and compression speed prescribed in the 2015 CPR Guidelines. ¿¿ CPR Quality Indicators: These only light when the compression depth and speed coincide correctly with the given default value.